Eco-conscious couples deserve a ring that aligns with their sustainable lifestyles. 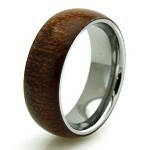 Our couple tungsten and Koa wood wedding rings may be just the solution you have been looking for. This two-toned ring is perfect for any modern groom who likes to connect to nature and will add the perfect finishing touch to your outdoor wedding. The Koa wood inlay on this ring is sleek and sophisticated for work or for play. In Hawaii, the word “koa” means “warrior.” We can think of no better way to celebrate your individual sense of style while highlighting your powerful presence. Better yet, tungsten carbide is extraordinarily resilient and will resist tarnish for a lifetime. 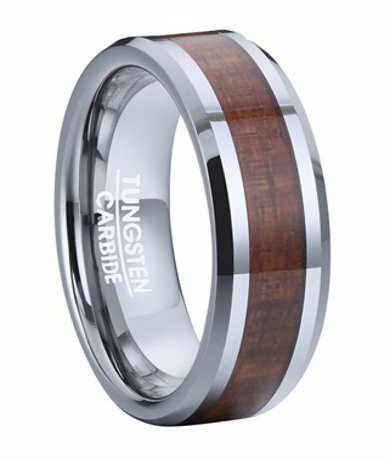 Tungsten carbide is one of the most popular alternatives to titanium, and it’s four times as strong! Our couple tungsten and Koa wood wedding rings are crafted with extra metal to create a slightly domed interior, which is particularly great for men with larger knuckles. Comfort fit rings usually measure a half size smaller than traditional rings. We recommend that you have your finger sized by a professional jeweler to determine whether a comfort fit wedding ring is right for you, your expectations, and your lifestyle. Take the next step in your relationship with a sustainable ring that highlights your free-spirited personality. 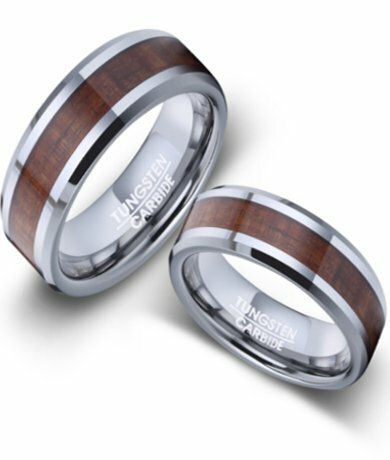 If you have any questions about our couple tungsten and Koa wood wedding rings, please contact JustMensRings.com today for more information.